New York Times Bestselling author Adriana Trigiani followed her wildly successful Big Stone Gap series with poignant, hilarious novels featuring lovely Italian families in New York. ( Lucia, Lucia, The Queen of the Big Time, Rococo, and Very Valentine). 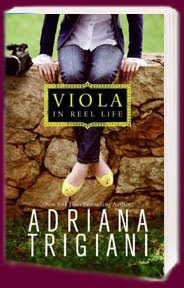 Her new book, Viola in Reel Life, will be released September 1 (available for pre-order). When fourteen-year-old Viola is sent from her beloved Brooklyn to boarding school in Indiana for ninth grade, she overcomes her initial reservations as she makes friends with her roommates, goes on a real date, and uses the unsettling ghost she keeps seeing as the subject of a short film—her first. Put it this way: If Adriana Trigiani writes it, I will read it. Recently, I had the unbelievable privilege of interviewing Ms. Trigiani. Check her Web site for tour dates or follow me to her Dallas book signing September 17 at the Borders at Preston and Royal. Joan: Each time I read one of your novels, I dub it my favorite. Do you have a favorite? Adriana: Thank you! As for favorites--I really don’t have one--I’m a good mother (in that way). I love all my children equally. Joan: Speaking of children, Viola in Reel Life is your first venture into young adult fiction. What led you to write in this new genre? Adriana: Tara Weikum, my editor--called and asked. I’ve been dying to write a young adult--as this was the period when I got hooked on reading--I loved Beverly Cleary, Madeline L’Engle and Louise Fitzhugh when I was a girl. I used to pick them up on the Bookmobile. Writing young adult books is like a trip back on to the bookmobile for me. Joan: I’m excited Viola will encounter a ghost. Tell us about the spirit and why you chose to introduce a supernatural element into the story. Adriana: Well, I was looking for a way to explain the unseen--the spark an artist experiences when she goes to create a poem, a book or a movie--the impulse--and in the case of Viola Chesterton, a budding filmmaker--she learns about her artistic impulses via a very delicious story about an event that happened on the campus many years ago. I wove those two ideas together. Joan: Most of your books center around families, yet Viola is sent away to boarding school. Is this intentional? Adriana: It’s so interesting. I still consider VIOLA IN REEL LIFE about families at its center--Viola is part of a loving and interesting family, who are very present in her life and the book. She also becomes part of a boarding school family. I really never venture far from my deeply ingrained themes- even when I try! Joan: I imagine that’s the reason your books are so beloved. I’m thrilled your latest adult novel Very Valentine will be another trilogy and am looking forward to reading Encore Valentine next February. Will Viola also be a trilogy? Adriana: Thank you--I’m so excited for you to read Encore Valentine. I’m crazy about it--it’s in its final copyediting stage now--and today I go and look at the cover art--always a wonderful part of the process. As for Viola--expect a lot more of her--three to start, and hopefully more! Joan: Your fans will be very happy. You have a strong connection to your readers, and I understand you listen carefully to them. Have you ever been surprised by a reader’s reaction to one of your novels? Adriana: Not really--though the responses run the gamut. There is criticism, and praise, and my favorite letters are about the families of my readers--and stories of their lives. Joan: You use a lot of personal family history in your books. Do you have plans to write a book about the wisdom your grandmothers passed on to you? Adriana: I keep a book for my daughter, and hope to write a non-fiction book based upon it for my readers. Joan: With such a full schedule, how do you find time for everything: writing, directing the Big Stone Gap movie, answering your own email and caring for a small child? Do you sleep? Or have a clone? Adriana: I’ve always been aware, even more so today because I’m a mother--of the ticking of the clock. My mother gave me very good advice when I had Lucia, she told me that I can do anything, as long as my family comes first. I build my life that way, and believe me, I fail a lot, and come up short. But, I also know my time on this earth is limited, and I try and make the most of the time I’ve been given. I am very lucky, and I know I’m lucky. I figure the best way to honor the blessings is to work hard and do my best. I answer the emails personally because my readers take the time to write to me, and I owe them a proper response. I’m a good sleeper--I go to bed early and rise early. As for clones--one of me is enough! Joan: As an author of very visual stories, art plays a big role in your books, and I understand you keep a sketchbook, fabric and other relevant items close to your desk. How does this practice help you create visually stimulating characters? Adriana: I was very lucky to have a professor at Saint Mary’s College--Dr. Reg Bain, in theater. The first thing he had us create was a collage inspired by reading a play. This became a habit with me. I collect odd items and fill my desk with them. Maps, bits of fabric, beads, small paintings, you name it--it has the potential to inspire me. When I met the great Mario Buatta, he shared that he creates a board for every interior design project. Tactile objects, old letters, texture, materials--all these things inspire me. Joan: Speaking of art, your book covers are stunning. We've heard horror stories of authors not having a say in their cover art. Did you just get lucky? Adriana: Thank you. I love my book jackets and cover art. After I’ve written the book and the editor and publishers have read it, we have a lot of discussions and meetings--about everything from color palette to message. I’m right in there with the cover artists. I have been very lucky--my designers are brilliant. Joan: How often do you travel to the places in Italy your characters visit? Would you consider writing a book set entirely in that country? Adriana: I travel annually--all over the place and mostly--Italy. Yes, I’d love to set an entire book there--and other places I have been fortunate enough to visit. Whenever I leave home, I find something wonderful. My job as an artist is to soak up the details of a place and bring the lush landscape to my readers. Of course, the characters and story have to live up to the settings, and in my novels, I hope they do! Joan: They absolutely do! Thank you so much for joining us! Readers, if you haven't pre-ordered and want to win an autographed copy of Viola in Reel Life, leave a comment. But hurry; we’ll only take entries from people who comment before midnight on Thursday, August 6, so check back on Friday to see if you’ve won. Be sure your comment links us to contact info for you or contact us at wwwtx6 (at) yahoo (dot) com. Also, unless you're willing to spring for postage, winner must live in the U.S. I must read this...sounds wonderful! Interesting interview. I haven't read her books, but they sound right up my alley. I'll add them to my to-read list. Great job, Joan. I enjoyed the interview and was especially intrigued by the odd collection of items relevant to her story that she spreads across her desk. Although I haven't read any of her writing, I definitely plan to. I love her books, especially the Big Stone Gap ones--probably since they were the first ones I read. I'd love to win her new one! Please enter me in your drawing. Great interview. Great interview, Joan. Sorry I was late for an autographed copy. She's another reader to put on my list. I also enjoyed the postings of your fellow group members. Very entertaining interview, Joan. Haven't read any of Adriana's books, but I'll be sure to check them out. Was great seeing you again. Wished we could have talked more. Hope we'll get a chance to do so soon. Hi Deb--it was great to see you, too! Glad you liked the interview. My favorite Trigiani book is Lucia, Lucia (in case I haven't mentioned it 500 times already!) though Very Valentine is wonderful as well.